Properties in Russell average 4.6 out of 5 stars. Property 9: A Noble View. Comfortable 3 bed-roomed home with sweeping harbour view. Property 16: Sunny comfortable holiday home. 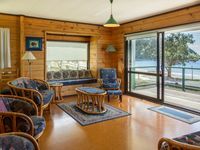 Property 17: Kiwi Seaside 1950s Bach, Godwin Cottage. Property 21: Waterfront - 8 minute walk to Village- Linen optional -see below description. 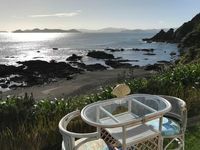 Property 25: Heart of Russell, key to the Bay of Islands. Property 33: A private and quiet Russell villa for two.